"He laces our fingers and shrugs. And I’m dead. I am actually dead. holding hands with the cutest boy I’ve ever met, and I’m dead. I’m the deadest zombie ghost vampire who ever died. And now my mouth isn’t working. It's like I'm stunned into silence. Let me start by saying that I'm generally not a huge YA contemporary person. I don't usually connect with the characters anymore, having passed the high school age. However, I make exceptions for books that are insanely hyped (on Twitter, Tumblr, Youtube, wherever). The anticipation for this book, for example, was huge; two authors (who are big names within the YA contemporary genre) teaming up to write a LGBTQ+ love story? I couldn't really pass that up, could I? What If It's Us centers around two boys, Arthur and Ben, who both live in New York City. Ben has just broken up with his ex-boyfriend and goes to take a box of his ex-bf's stuff out. Then there's Arthur, who has just moved to NYC for the summer only. The two have a meet cute at the post-office, but they end up losing track of each other. After their fate meeting, the two start social-media stalking each other to see if fate will bring them together again. That's basically the gist of the story, and about all I can say without going into the book too deeply and spoiling aspects of it. "I barely know him. I guess that is every relationship. You start with nothing and maybe end with everything." What did I think about What If It's Us? Firstly, I want to address the pacing of the book. YA contemporaries are usually quick reads for me anyway, but I really like how quickly this book handled the meet-cute and the events that took place after. It didn't take absolute ages before the romance aspect of the book came to frutition and there wasn't a bunch of very unnecessary drama (or, let me say this differently, there was drama, but not the annoying kind). I think the struggles both Ben and Arthur faced were very representative for their respective ages and also kind of relatable in a way that doesn't necessarily have to do with romance. Arthur wants the relationship to succeed too bad, and Ben is the one who doesn't try enough, which isn't necessarily only applicable to romantic relationships but also to friendships. This made the book relatable for me, which, as I mentioned earlier, isn't necessarily something I find within this particular genre. I really liked the pop-culture references within the book. Arthur is a huge Broadway fan, which provided some fun references and quotes within the story (SPOILER: The scene where they both end up listening to Hamilton in front of the building was so cute!). Despite a lot of the earlier reviews I've read for this book, the references didn't annoy me. They didn't feel forced or too much. I liked the inclusion of popular media within the book because it made the book feel realistic. I also really like how they addressed Ben's ethnicity and his family dynamics, as well as Arthur's ADHD. The book really includes diverse perspectives, which is something I really liked reading. The only major thing I had issues with was the ending. I'm not a huge fan of endings like these, because I, as a reader, look for gratification. 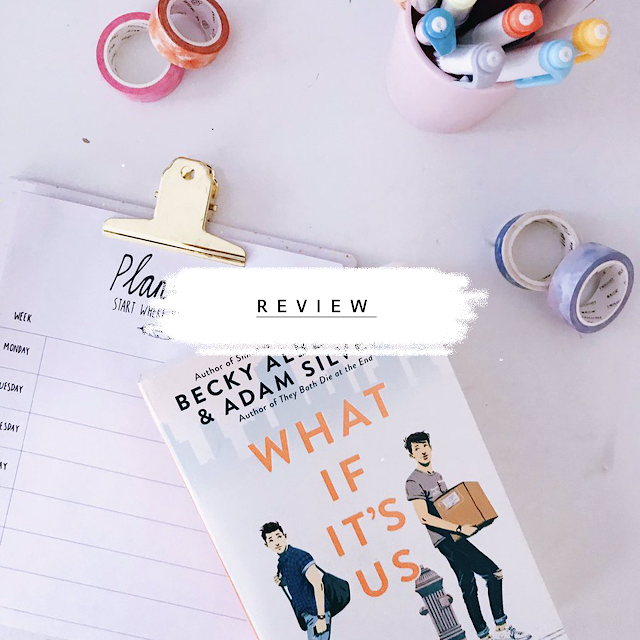 I felt like a lot of things were left unanswered and open, and it didn't really satisfy me as a reader. “God, Arthur.” He kisses me. This book, despite its ending, was really really cute. The characters were cute, the romance between these two boys (the authors also included ADHD and made one of them POC!) was delightful to read. I really enjoyed this quick YA read, so I'm giving this 3.5/5 stars but I hope the authors will work on a potential sequel in the future! Hi, I'm Julia, Jules or Ju for short! I'm a 22 year old Dutch girl with a degree in literature and linguistics, who's currently getting her MA in North American media and politics. I'm a music teacher, and a graphic designer on the side. I read A LOT and I dabble as an artist. On this blog you'll find my love for all kinds of things, from book reviews, to music, to art & more! julia has read 28 books toward her goal of 200 books. 21 year old Dutch artist/aspiring musician who enjoys literature, fashion, art, television, and beauty. Majoring in English Studies/North American studies.